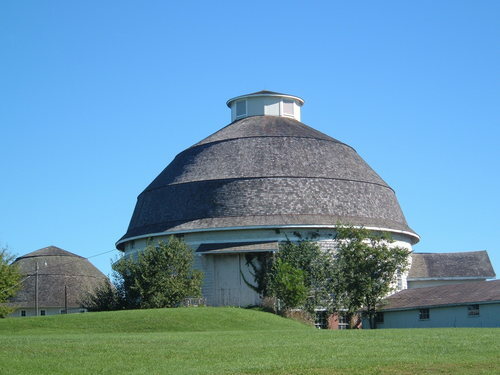 First built by the Shakers in 1824, round barns required less lumber and bracing the frame. Construction was also simplified, as no elaborate scaffolding was required for the circular arched roof. The barns also proved more resilient against prairie storms. The barns pictured here were built around 1910 and are owned by the University of Illinois. Vindaloo sounds very Indian, mainly because aloo is Hindi for potato, but the aloo in vindaloo has nothing to do with potatoes. Vindaloo comes from the Portuguese Vinho de Alho, a pork dish prepared with wine vinegar and garlic. The Portuguese brought this recipe with them to Goa, a small kingdom on the east coast of India,which was a Portuguese colony from the 16th century to 1961. In its Goan incarnation, vindaloo was prepared with traditional Indian spices such as cumin and chilis. In other words, it's fusion cuisine -- and I love it! The owners of my favorite Indian restaurant make great vindaloos, they speak Hindi, and their name is Rodrigues. Where have they been all this time, Jeff? Could Jane Have Noshed a Vindaloo? Historians have found that Britain's first Indian restaurant was opened in 1809, in the midst of the Napoleonic wars and during the period in which Austen set Pride and Prejudice. The Hindoostane Coffee House was established by Sake Dean Mahomed, an Indian-born entrepreneur, as a purveyor of Oriental food of the "highest perfection" in Marylebone, London, which at the time was a residential district for the well-off. I can imagine how this story is going to change all those costume dramas set in the early 19th Century: "Pray excuse me sir X, but I am in urgent need of a chicken korma." Piles of cocaine. With pictures of Teletubbies on them. Why? Who knows? Who wants to know? Merely "knowing" would ruin the perfect Zen of the moment. An Anglican church leader in Baghdad has warned that Iraqi Christians could be adversely affected by a Church of England bishops' report criticizing the Iraq war and suggesting that Christians apologize to Muslims. "They've got to take seriously the Anglican churches in these [Muslim] nations," the Church of England Newspaper quoted Canon Andrew White as saying in its weekly edition published on Friday. "The situation is dangerous on the ground and what is said in the U.K. has a profound effect," he added. . . .
White is the rector of the St George's Memorial Church, Iraq's only Anglican congregation. He is also a Church of England expert on issues regarding reconciliation in the Middle East, and has been involved in conflict resolution and hostage negotiations. White noted with evident dismay that the drafters of the report -- four leading Church of England bishops-- had not contacted the Anglican bishop responsible for Iraq, Clive Handford, whose area of responsibility includes Jerusalem, Iraq, Iran, Egypt and the Gulf. Read what these poobahs had to say while their pompous British asses were safely ensconsed in their gentlemen's clubs.